You've got a murder mystery. Perhaps you wrote it yourself or you bought it online or at a game shop. 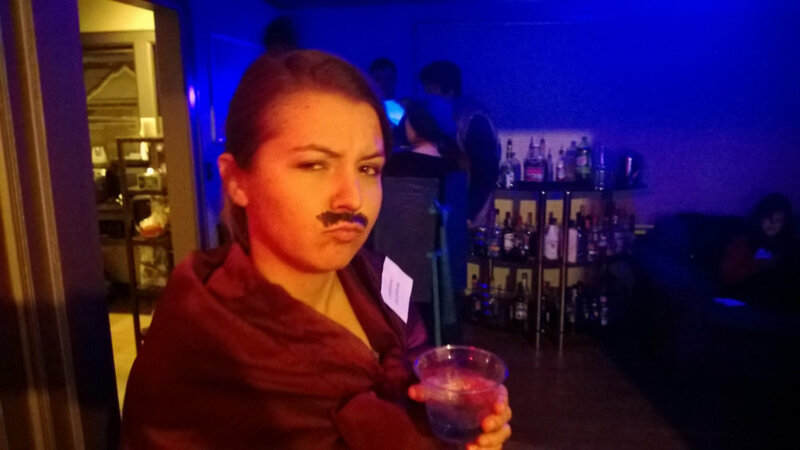 It's your standard murder mystery and you want to fluff it up with some drinking rules. Everyone knows that murder mysteries are more fun with booze. It helps grease the wheels of role-playing and eases the occasional awkward player who isn't accustomed to wearing a costume and acting like a goon in front of her friends. Here are some tips and tricks for turning your vanilla mystery dinner night into a debauchery filled murder-fest. Every murder mystery has a theme. Sometimes they are set in the Wild West, sometimes in the Roaring 20's. One of the greatest things about the settings, places, and time periods that murder mysteries often take place in is that they leave ample room for your imagination to run free to come up with ideas for themed drinks. If you don't have imagination, then Google can spring board you straight into some perfect ideas. Whiskey cocktails for a Wild-West mystery, Wine (and wine mixes) for the Medieval Royal Ball, and Champagne and Manhattans for the 20's Masquerade Dance are all great places to start. Found a space themed mystery? Tonic water glows in the dark due the presence of quinine, so make a list of tonic based drinks and put up some black lights to lend your mystery that futuristic aura. Try setting out some different colored powdered drink mixes so your guests can customize their shiny beverage. At the very least, there is a beer somewhere in the grand spectrum of beers that exist that matches the theme of your mystery. Keep on the lookout for British browns to fill your castle, pumpkin beer for your Halloween, and Pilsner for your Polka party! If the drinks are there, your guests will drink them. Every character in every mystery has a distinct personality. What would they drink? The dainty princess drinks her Wine Spritzer (hurrah for anachronism!) and the dangerous outlaw drinks straight whiskey. If your guests know their characters ahead of time, let them think about it and bring whatever they think is right. It's possible they can pull some insight out the character you never thought of or even create a new nuance in their character's personality. OK, maybe alcohol doesn't have the power of characterization among its many assets, and I'm giving it too much credit here... No... that doesn't seem right; alcohol is definitely the best. The Cicerone in me is talking, and he says that every character has the perfect beer pairing that makes the character, or at least your tipsy portrayal of them, really shine. While it's likely that your group will be holding a drink and casually sipping throughout the course of the game, you can ramp up the rage-factor with a few drinking rules. You can get as creative as you want with these, making up new ones as you and your group see fit, but here are some good ones to get you started. Ghost Shots - every time someone dies, all the dead characters take a shot. This is my favorite consolation prize for dead players. If the mystery revolves around a single death, then everyone takes the shot when that player dies or the dead body is revealed. Out of Character - any time someone breaks character, for example by calling someone by their real name or forgetting to use the accent they've been using all night, they have to take a sip. In Character - whenever someone does a spot-on job of role-playing their character, everyone nearby has to drink. For example, if someone drops an improvised joke their character might have said or makes up and uses a catch phrase. Soundtrack - you create a custom sound track that includes a song for each character and play it in the background. Each player knows their character's song and when it comes on they have to drink. If they fail to notice their song playing while other players do, they have to finish it. Accusation - take a drink whenever you get accused of being the murderer. Drinking Tell - take a drink whenever you lie, assuming your character has information to hide. Monologue - as soon as someone starts to Tim Curry Clue Monologue in an attempt to solve the mystery, everyone starts it off with a waterfall. The easiest way, in my unbiased opinion is to Intrigue Brewing mysteries. These mysteries are written from the ground up with drinking in mind. Characters already have customized drink recommendations, the theme has matched drinks that fit perfectly in the setting, and drinking rules are set up to be triggered often! Your road from awkward sober actor to drunken role-playing master has been smoothly paved. A Murder Mystery at Intrigue Brewing is a great place to start.